Your engine oil low light appears on your dashboard when you are in a hurry. You are purchasing 2 liters of engine oil and topping up your engine with it. You check your dipstick and realizing that you have overfilled the oil above the MAX sign on the dipstick. What to do now? Will, it damages my engine if I keep driving with the level over the max? 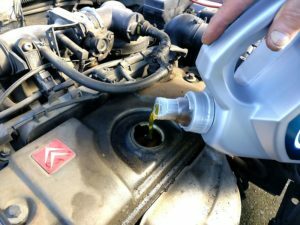 In this article, you will learn what will happen if you are overfilling engine oil and learn what signs to look for. Is it dangerous to drive with overfilled engine oil? Overfilling your engine oil can cause serious damages to your engine. Some common symptoms are oil leaks from the engine and blue smoke from the exhaust pipe. If you have only filled a couple of millimeters above the max sign, there is no need to worry. But if you have filled a centimeter above the sign, it can cause severe damages to your engine. The engine oil reserve is designed to hold some extra oil to compensate for the fluid expansion which happens due to the hot condition. Adding an extra half a quart will not damage your engine. However, anything more than that could be harmful to the engine. When you add too much oil, the excess oil will go towards the crankshaft, and as the crankshaft rotates at a high-speed, the oil is mixed with the air and ‘aerates’ or becomes foamy. This foamy texture of the oil acts like a bad lubricant, and as a result, the oil is not pumped effectively. Over the time, the engine will starve for proper lubrication, and due to the weak oil pump, it can get locked up. Routine oil change is a part of car maintenance, and it should be done after every six months or 5,000 miles. Oil change is a relatively simple process and could be done at home as well. However, a small mistake can prove to be fatal for your car and could cost you hundreds of dollars. We are talking about overfilling the engine oil which can severely damage your car’s health, but we are here to explain to you how to tackle the situation. Most of the engines require 5 to 8 quarts of oil, but it varies depending on the size of the engine. For example, a 4-cylinder unit will require 5 quarts of oil whereas a larger 6-cylinder engine may need approximately 6 quarts of oil. You can also find more information about your engine’s oil capacity in the owner’s manual. Always be careful that you fill the right amount. Sometimes you do not know if you or the mechanic have overfilled your engine oil. But if you have some of these symptoms, there might be a risk that your engine oil is overfilled. If you have noticed any of the above symptoms, it is likely that there is too much engine oil in reserve and steps should be taken to fix the problem. To ensure that there is excess oil, stop your car somewhere safe and shut off the engine. Open the hood and check the dipstick oil level to see the oil stain. Most probably it will be above the top marking indicating that excess oil is present. The second method is a traditional one and can be messy as well. The tools required are a drive socket wrench and a plastic oil pan. Raise your car to some height then crawl underneath and locate the plug. 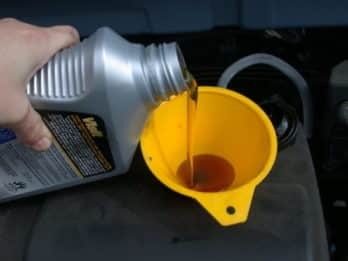 Place the plastic oil pan beneath the oil plug and loosen the plug until the oil begins to drip. Make sure you don’t loosen the plug too much and remove only a certain amount. Check again with the dipstick to ensure the oil is of right amount. Note: Some vehicles do have a cover under the car that has to be removed before you can reach the oil plug. Now that you know how important it is to keep the engine oil at its optimal level make sure to double check every time you take your car for the routine oil change. The recommended oil change schedule and the amount of oil your car engine need is mentioned in the owner’s manual. Sometimes if you had your car at a bad workshop, they might only fill the amount of oil from the information they got from their computer. Because of that, even a mechanic can make a mistake and forgot to check the oil level after a service. That’s why you should always double check after you or your mechanic have filled oil in your engine. Overfilling your engine oil can hurt your engine and damage a lot of parts in your engine. Be careful when you are filling your engine oil that you got the right amount of oil. If you have any other questions about overfilling your engine oil, comment down below. If you have any other car questions, you are welcome to ask us at our homepage. i got my 1985 v8 rv servised oil was over filled. drove 800 hundred km never noticed any problems should i worry. If it’s not leaking any oil you do not have to worry! It all depends on how much you overfilled it with. However if it does make noise and vibrate there is a risk that any internal of the engine got damaged. You have to drain the oil again and fill it with the required amount and check if the noise is gone. If it still occur, I would recommend you let a mechanic listen to the engine before driving it, which could cause even more damages.